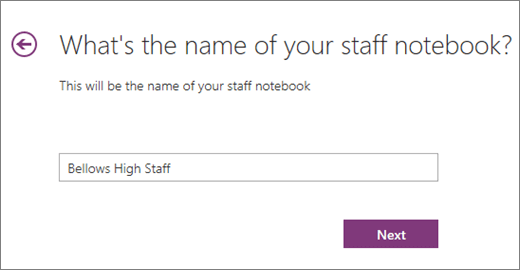 Staff Notebook is part of OneNote for Office 365. 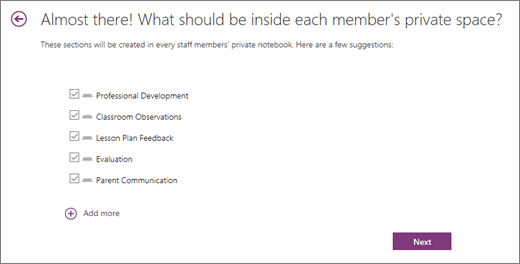 Each one includes a Content Library for staff leaders to share resources, a Collaboration Space where all staff can work together, and a section group for each staff member that only that staff member and the notebook co-owners can see. Staff leaders and members can access their Staff Notebooks from any device using the OneNote app. Note: You need administrator permissions in Office 365 to create Staff Notebooks. Ask your IT professional if you’re not sure. Sign in to Office.com with your school email and password. Select the App menu (9 squares inside a square), then select All apps, then Staff Notebook. Follow the instructions to set up your notebook, selecting Next to navigate between steps or to skip a step. You'll name the notebook, add people who can use it, and set up notebook sections your team will use. Your Staff Notebook is ready! Use the link on this page to open your notebook in OneNote. The staff members and co-owners you added will receive an email with a link to their notebook.